People move from all over the country to the desert in hopes that they will receive relief from their allergies. Unfortunately, it is a myth that allergens are not present in the desert. In fact, Arizona has been found to have twice the national average of allergens! Luckily there are options for overcoming your allergies in Tucson. We will lay out a step by step plan to finding allergy relief. Instead of relying on your primary care doctor to determine exactly what allergens are causing you to suffer, turn to a specialist. When you are given an allergy test by your primary care doctor, there are many factors that are often overlooked that can lead to misdiagnoses. The doctor may simply put you on a decongestant medication without addressing the specific allergy. When you opt to see an ear, nose, and throat allergist you will be thoroughly prepared before being given a comprehensive allergy test. Some of these preparations include: a full physical exam, being weaned off of any medications that can affect the test, being put on a specific, allergy elimination diet, etc. Do you have allergies? Take the quiz and find out more! When working with a specialist, they should be able to give you multiple options for how you would like to be tested for allergies. The Carlson ENT allergy testing Tucson team offers a range of different testing methods for you to chose from. The first method of testing that we put forth is subdermal allergy testing. In this method, we place the allergen directly into the body, under the skin, so that the reaction can be measured and accurately assessed. This testing method is desirable because a reaction, or lack thereof, leaves no question as to whether or not that patient is allergic to the particular allergen. The second method that we use to test allergens is through a RAST test. RAST stands for radioallergosorbent test, which is a type of blood test. This test is comprehensive and searches for allergen related antibodies that could trigger allergic symptoms. This test is generally recommended for those who have any dermatitis, or other skin conditions, as well as for those who have a history of severe, life-threatening allergic reactions. Any quality ear, nose, and throat allergist will offer multiple treatment options to their patients. 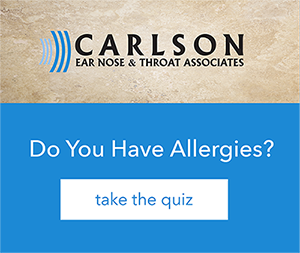 At Carlson ENT, you have the choice of a multitude of different treatments, depending the allergy and seriousness of the allergy. Our doctors can prescribe allergy medications, dietary controls, and if the symptoms become more severe, injections can be implemented. If the idea of having continuous shots is undesirable, we at Carlson ENT can offer a sublingual treatment that is both potent and painless. The sublingual treatment is a drop of medication that is applied under the tongue. The medication comes in a convenient, travel sized bottle that can be used at home, or on the go. Our sublingual allergy treatment allows allergy sufferers to find relief without having to come into the office on a continuous basis for treatment. The last step to treating allergies is maintenance. Some allergies are perennial, which means that they exist year round, and others are seasonal, meaning that symptoms get worse during different months of the year. (Check out our allergy calendar to find a full list of allergens that are active during different times of the year in Tucson.) Both kinds of allergies need to be continually treated in order to reduce or eliminate symptoms. Another factor to keep in mind is that your allergies can change over time, throughout your life. You may find that a peanut allergy that you had as a child is no longer an issue, however, as you get older you might find that you break out in hives if you eat avocados. This is just an example to illustrate that allergies are not static. As your body changes throughout your life, your reactions to different allergens may differ. In order to stay on top of this, it is advisable to get a comprehensive allergy test whenever you feel as though the symptoms you are suffering from are due to an allergic reaction. Luckily, it terms of allergy testing Tucson is a great place to be.